The chevron pattern seems to be a big deal these days, so I decided to make some pillows for my bed using that pattern. Lovely! Make the chevron pattern out of cardboard using a small triangle as your pattern. This is really hard to describe, but you can see where the triangle fits into my chevron patter piece. Just trace it and cut it out like so. It can be any size you desire. My pillow form is down feather and measures 26" x 26", and since it's down feather, I did not add seam allowance. I didn't want a floppy pillow so I made my chevron pattern 26" long. Trace your pattern onto felt. Felt doesn't fray and that is why I chose it. I did not want to have to hem it! I think that would have been a nightmare. Cut it out. I used 5 chevron strips per pillow. Cut out your base fabric (white) and your lace. I cut them 26" x 26" again with no seam allowance only because it's a down feather pillow I wanted it to stand up better. 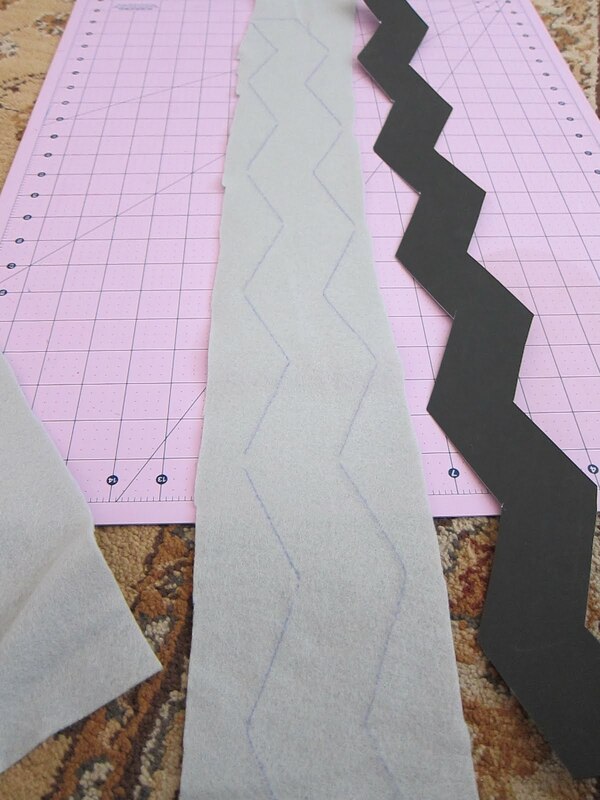 Lay out your white base fabric and situate the chevron pattern evenly on top of it. Pin it in place and tac it down (sew it) in place. You could also use fusible interface if you don't want to tac it down. Place your lace on top. This is an envelpoe pillow case so I cut out two back pieces. I always refer to Make-it and Love-it for my pillow assembly instructions. Each of my back pieces were 26" x 17". Make-It and Love-It explains how to sew it together so well, I just left it to her to do the explaining ;) Be sure to check it out. And Bam! Here's the end result.